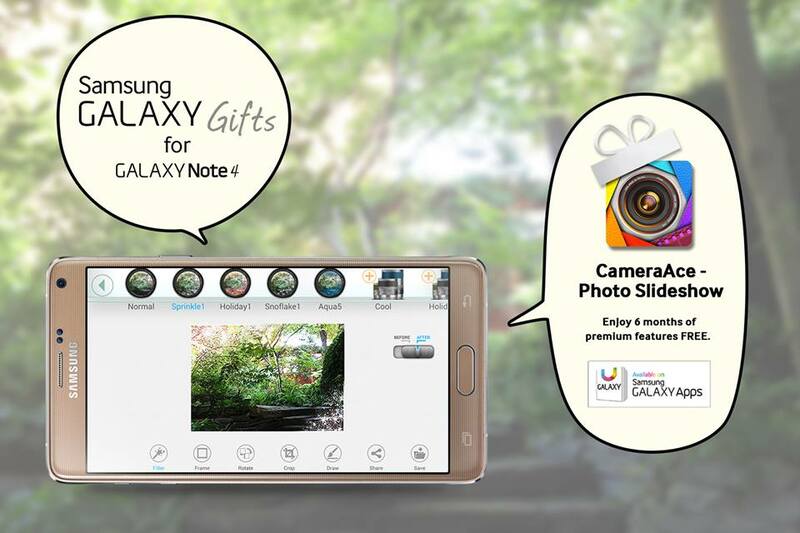 Don't fret if you don't have a Samsung Galaxy Note 4, stay tuned because we will be running a 2 week, CameraAce Premium free trial event for all CameraAce users! [Holiday Event] CameraAce Premium: Share up to 48 photos per slideshow and more! CameraAce Premium service is the perfect option for the CameraAce power users who seek to maximize their photo editing and sharing experience, and now you can try it for FREE! Premium subscribers can use up to 48 photos per slideshow, compared to just 24 photos in the free subscription. With the increase creative space afforded by longer slideshows, you are going to want to be able to create even more slideshows, which is perfect because CameraAce Premium allows users to manage up to 100 slideshows instead of the normal 10. Users can also toggle sharing to hide slideshows when they want to keep them private. Although slideshows normally expire after 30 days, Premium Slideshows will last indefinitely. In addition, a CameraAce Premium subscription unlocks all downloadable content including over 130 premium filters and frames, as well as all of the newest updates. To take advantage of the event just click "Get the Gift" and buy one of options - 1 year or 1 month. It won't charge for 3 weeks and you can stop the subscription anytime you want. 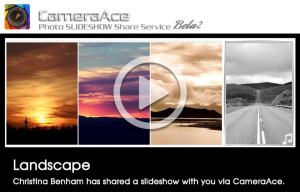 Congratulations to the CameraAce Slideshow Contest Winners! We have finally wrapped up the first CameraAce Slideshow Contest and we are excited to announce the winners! Congratulations to the winners of the event and a big thank you to all of our fans that participated! We received over 5000 entries, which took us a while to comb over, but it allowed us to view and appreciate each and every composition. We are glad to see CameraAce is helping our users make the most of their memories and we hope to continue to provide the best mobile photography tools for your use and enjoyment. Once again, congratulations to all of our winners and please stay tuned for future CameraAce events. Stay up to date with the latest app and event updates by liking our Facebook Page. Congratulations CameraAce Slideshow Contest Winners! Christina's slideshow came in 1st place among our 10 finalists with 21 "Likes." Users and judges were impressed by Christina's slideshow's stunning landscape photos utilizing CameraAce's collage composer, frames and filters. Christina's slideshow is a wonderful demonstration of the beauty of photography and the power of CameraAce coming together as one. Our hearts were warmed by the thousands of entries that our loyal fans submitted for this contest. It was truly an amazing experience to peek into other worlds and discover the joy and beauty that people capture everyday with their smartphones. We would like to once again thank every CameraAce user for participating in our Slideshow Contest and for continuing to make CameraAce amazing with your creations and feedback. We are very fortunate to have reached 1,000,000 downloads with all of your help! Please stay tuned for additional contests in the future, and as always, drop us a line at support@cameraace.net if you have any questions, comments or feedback. After reaching our 1 million download milestone, we thought it would be a good time to look back at what we've done right, and what we can do in the future to create an exciting user experience. Based on all of our user's valuable feedback, we had come up with several ideas for the future of CameraAce. We wanted to refine our focus so we conducted a survey to see what features were of highest priority, right now. We reached out to over 30,000 recent users and are very appreciative to those who responded—they were rewarded with a free MosaicAce download. Stay tuned for future opportunities to receive freebies by participating in CameraAce events and surveys. 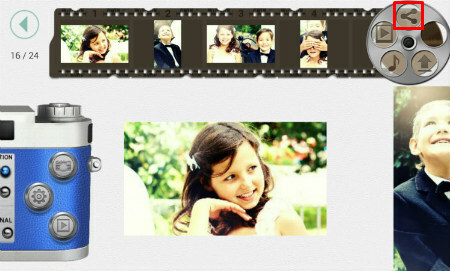 The first question was “Which CameraAce feature do you like the most? (Choose2)“ . We found that the most appreciated feature is the ‘Slideshow creator and sharing feature,” with "Photo filters & frames" in second. This was no surprise to us since the Slideshow Sharing Feature was the most requested feature before it was implemented. We were very happy to find that you guys enjoyed this feature so much! The second question we asked would determine our priorities in the development plans. 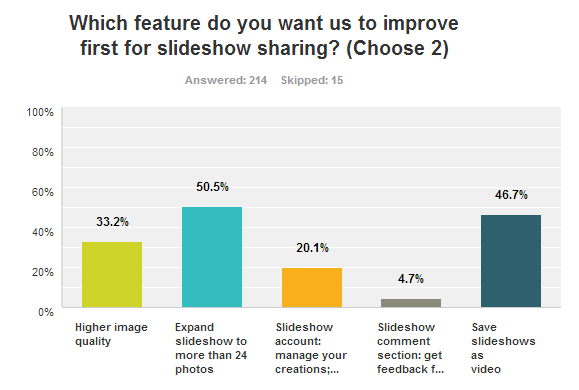 We wanted to know which feature was most desired to improve the slideshow sharing experience. Surprisingly, the most requested feature was to allow usage of more than 24 photos for a slideshow. Currently because of technical and bandwidth related issues, we have limited the slideshow photo capacity to 24, which is like a roll of film. 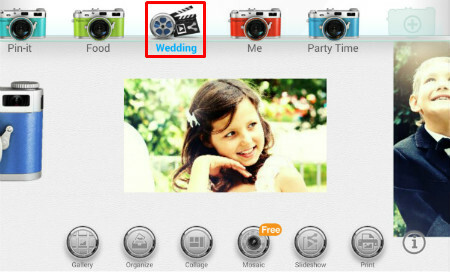 The second most requested feature was the ability to save slideshows as video and to keep them stored indefinitely. “Preview in real time.more coice for duration of pics. photos large enough not to get eye strain. save as draft? What do you guys think of the survey results, do you agree with them? Let us know what you think! Comment on this article or send us your thoughts at support@cameraace.net This is your chance to make CameraAce into the app that you truly desire. 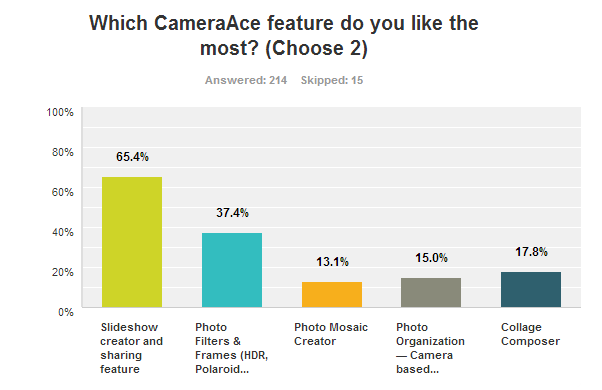 Your opinion has a direct effect on CameraAce development and we greatly appreciate the feedback! Thank you very much, we look forward to hearing from you. 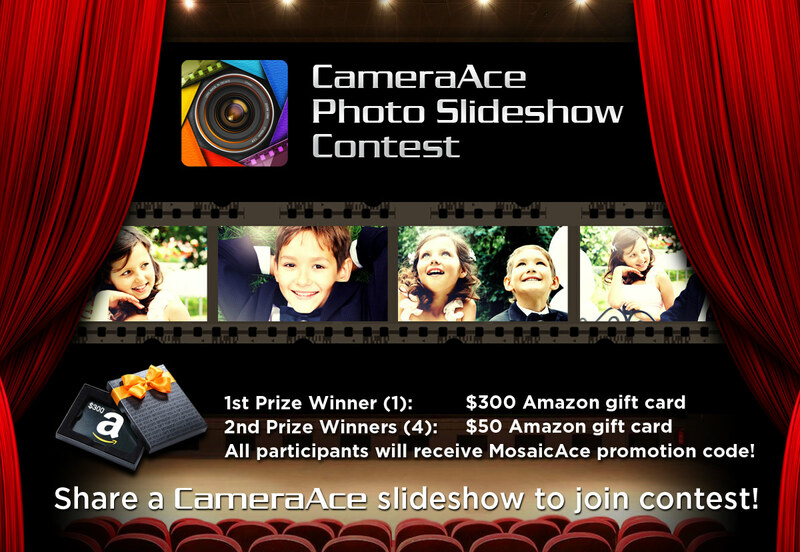 CameraAce Slideshow Contest: $300 Grand Prize, all participants get a free MosaicAce download! Cheers to all of our CameraAce fans! We are excited to announce our latest event to showcase all the wonderful content that you guys have been creating with CameraAce. We want you guys to show us—and all the other fans—your best photo slideshow creations. A judging panel of photo experts and enthusiasts from the CameraAce team will select the top two slideshows based on a) how creative it is; b) the extent to which it is inspirational; c) how it tells a story; d) popularity based on number of Facebook likes and d) the overall quality of the submitted slideshow. The grand prize winner will be awarded a $300 Amazon Gift Card and 4 runner ups will each receive a $50 gift card. All participants will receive a MosaicAce promo code. 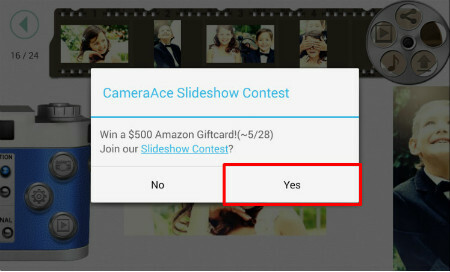 When prompted to join contest, select "Yes"
Finalists will be selected on June 2nd and notified via Email. Vote for your favorite finalists on our Facebook fan page and be sure to share your submission with all your friends and family! 3) When asked to join the contest, select "Yes"
Good luck everybody, we can't wait to see your wonderful submissions! 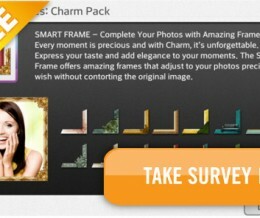 Free Charm Frame Pack Download with 3 Question Survey!